Mechanicsburg, Pennsylvania located in Cumberland County is very familiar to me. My grandmother lived there most of her life and all of mine and my father studied at the Mechanicsburg schools. Since she's been gone, I've been back a few times a year for various events. Once every several years I even lose my mind long enough to think it will be fun to join in the hustle and bustle of Jubilee Day, the longest-running, one-day street fair on the East Coast. Jubilee Day started 92 years ago as the "Farmers and Merchants Jubilee Day." Today, it is held every third Thursday in June. During this time, Mechanicsburg's Main Street shuts down to accommodate approximately 70,000 visitors who attend the event and each year the press stands among the throngs to report on the food, the vendors and the musical entertainment on tap that day. I, too, was assigned there once. My job was to explain how technology plays a part in the festival these days. You can read all about it here. If attending Jubilee Day sounds like something you'd enjoy, you can learn more by clicking on this link. This year's extravaganza takes place on June 16 and runs from 10 a.m. to 9:00 p.m.
One thing I also learned about Mechanicsburg in the last five years or so is that it has the dubious distinction of being the northernmost town to surrender formally to the Confederacy--but only after the townspeople fed the troops. Volunteers shared this interesting fact when I visit a re-enactment staged in a local park for a story in 2013. History buffs reported that Brig. Gen. Albert Jenkins demanded residents deliver 1,500 rations to the town hall within the course of 90 minutes. He punctuated his sentence with a gunshot. Just this past Saturday, I learned more about the small town when I signed up for a walking tour hosted by the Mechanicsburg Museum Association. A group of about 10 gathered at the small museum located at 2 Strawberry Alley to view various artifacts like records dating back to the 1800's, which listed deliveries to numerous businesses around the area. I admired this picture which hung on the wall and scene of Mechanicsburg from years ago. Seen inside the Mechanicsburg Museum. The museum association is responsible for the preservation of the 1889 Washington Street Station, the 1866 Stationmaster's House, the 1886 freight station, the 1867 passenger station and the Frankenberger Tavern, which dates back to 1801. The Stationmaster's House--take a virtual tour by clicking here. Built by George Frankenberger, the tavern offered cattle drovers a place to sleep and a warm meal in exchange for a small fee. By all accounts, it was a successful business, due, in part, to the fact that Main Street was the main road from Harrisburg to Carlisle in the 1820's. In 1983, the structure was moved 100 feet from its original location to accommodate business development. A fire swept through the house next door recently putting the historical structure in jeopardy . Thankfully, only a few logs in the back of the building were singed, but you can get a glimpse of the devastation in the following picture. John Klinger, our tour guide, informed the group that the association acquired the adjacent lot and plans are in the works to clean it up and re-purpose the space. The property next to the Frankenberger Tavern caught fire putting the historical structure in jeopardy. Across the street from the passenger station of the Cumberland Valley Railroad, (which now serves as the museum) is the American House Hotel, which served diners and business travelers passing through the area. Today the structure has been converted into apartments. 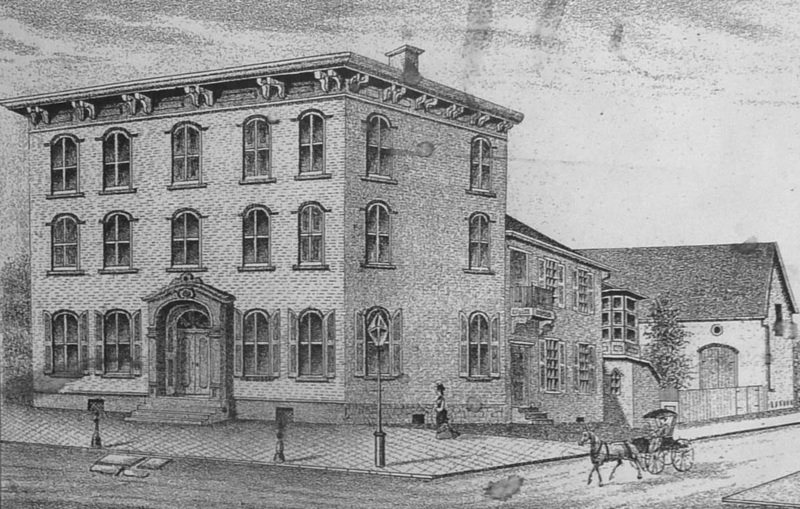 Formerly the American House Hotel serving travelers passing through Mechanicsburg. This imposing building on Main and Market opened in 1926 as The First Bank & Trust Company. The site was once home to Franklin Hall. Erected in 1866, Franklin Hall housed municipal offices and a space to accommodate approximately 600 people for movies and concerts, and included a third-floor Masonic Lodge. Pre-civil war residences like the one below were also discussed during the walk. A retired teacher who was on the tour said he knew the man who lived at this house located at 240 Main and that the structure was used as a bakery during the war. Although the facade was updated in 1957 to accommodate larger equipment, part of the current fire station dates back to 1907 and if visitors venture behind the building, they will see several pieces of history that have been preserved, including a hydrant dating back to 1858 and bells from Borough Hall and Irving College, which was founded in 1857 as the first women's college in Pennsylvania. An old fountain that served horses, humans and dogs is also located on the site. 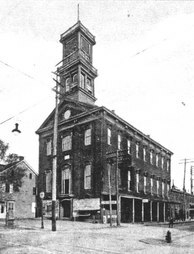 The oldest public building in Mechanicsburg, known as the Union Church, was built in 1825 and never laid claim to a regular pastor or permanent congregation, but was used temporarily for a small fee by congregations who couldn't afford a place of worship. Another tribute to the past along the main road is the Eckels building. Dr. George Eckels and his brother Walter opened their drugstore located at 36 E. Main Street in 1879 and it remained in the Eckels family for a century. Built in 1857, the structure was once home to Dr. M.B. Mosser. The business, which today operates as an ice cream parlor, also serves diners. Wooden booths and tables date back to 1929 and a marble soda fountain evokes nostalgic memories. For this reason, a scene in the movie"Girl Interrupted" was filmed there in the 90's. If you visit, be sure to walk towards the back of the dining room to have a look around the Pharmacy Museum. The business is closed on Mondays and Tuesdays. Below is a picture of Eckel's when it was owned by Dr. M.B. Mosser, before the storefront was added. And two buildings were fused together here in this structure that serves as a funeral home. You can see the seam quite clearly. Located several steps up the road is what is known to locals as the"G Man," otherwise known as the "Gingerbread Man." I still remember my grandmother asking if I was going to the "G Boy" back in the day and getting quite the laugh. Curiously, it's up for sale. I'll have to follow up on this one since it's been a mainstay in the area for years, but then again, Grandpa's Growler recently closed up shop also. Jacob Hurst's Dry Good's Store circa 1911--in operation since 1865. The "G Man" building used to be known as Jacob Hurst's Dry Good's Store and had operated on the site since 1865. Prior to that, it was a tavern and from 1936 to 1979 it was known as Klair's 5 Cents to Dollar store. For those who have yet to visit, downtown Mechanicsburg is safe and an easy walk comprised of just a few blocks. For retro fans, there's not only Eckels, but also Cache in the Attic. Art lovers will enjoy Metropolis Collective and 2nd Floor Gallery, which I wrote about in The Burg News here. Handmade, artisan chocolates can be found at Brittle Bark and history buffs will enjoy Civil War and More. These are but a few highlights of the charming town. The Museum Association is always planning new exhibits to share their enthusiasm for the history of the area, so if this type of information is also of interest to you, be sure to keep an eye on their website.